NEW ORLEANS – The Texas Relays may be the center of attention in the college track & field world this weekend, but there’s also superb competition slated on both sides of the nation over the coming days. 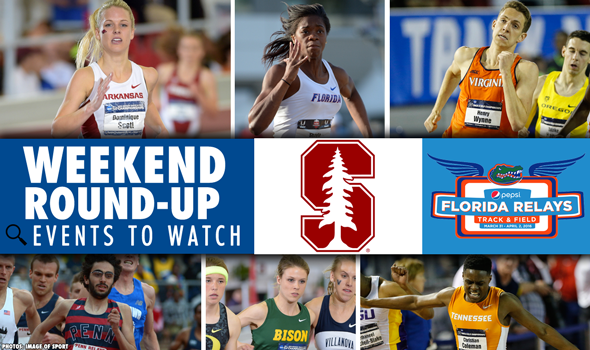 The Florida Relays headline the action on the East Coast, while the Stanford Invitational is the West Coast’s biggest offering in the first weekend of April. We’ve picked out three events to watch from both meets, and you can find all the information about both meets on the USTFCCCA This Weekend’s Meets page. Be sure to also check out the weekend broadcast schedule, which includes both meets at Stanford and Florida as well as the Texas Relays. Arkansas superstar Dominique Scott donned the Razorback jersey for the first time since cross country this past weekend, debuting against sparse competition at the Arkansas Spring Invitational in a nation-leading 4:15.61 over 1500 meters. Having exhausted her collegiate indoor eligibility, Scott was unable to compete for the Razorbacks indoors after finishing third nationally in cross country, but has this final outdoor season left on the books. Increased distance and increased competition await her in Palo Alto this weekend, starting with the 5000-meter distance over which she finished runner-up nationally last year. Chief among her collegiate competition will be returning outdoor All-American Liv Westphal of Boston College, indoor All-American Courtney Smith of Harvard, and cross country All-Americans Sarah Collins of Providence and Kaitlyn Benner of Colorado. This marks the first big men’s distance race of the young 2016 season, featuring plenty of names that will need to be remembered for the NCAA Championships in June. Tommy Awad of Penn is coming off a third-place finish in the mile at the NCAA Indoor Championships earlier this month, and he’ll square off once again with David Elliott of Boise State – who finished just two spots and less than a quarter second behind Awad. Also in his section are Colorado’s Ammar Moussa, NC State’s Luis Vargas, and Colorado State’s Jefferson Abbey, among others. The other sections are equally strong, featuring NC State’s Graham Crawford and Meron Simon, Oregon’s Jeramy Elkaim, Colorado frosh John Dressel making his collegiate outdoor track debut after an All-American cross country season, and Oklahoma State’s Cerake Geberkidane. This may not be the deepest event of the weekend, but the women’s metric mile features perhaps some of the most intriguing cross-event match-ups anywhere in the nation. In one section, you’ve got elite 800-meter specialists in former NCAA indoor runner-up Savannah Camacho and reigning NCAA outdoor runner-up Claudia Saunders of Stanford stepping up in distance. Then in the first section you’ve got North Dakota State’s Erin Teschuk, who is primarily a steeplechaser outdoors but has enough speed to have finished sixth in the mile at NCAA Indoors this past season. She’ll be taking on Maddie Meyers of Washington, who was eighth in cross country this past fall. Three different NCAA Champions/near NCAA Champions from earlier this month will potentially square off in Saturday’s final in another fun cross-event (and cross-Division) showdown. Christian Coleman of Tennessee could be on track for a special outdoor campaign after winning the 200 and finishing third at 60 meters at NCAA Indoors earlier this month. Just a sophomore, he didn’t make it to Eugene at 100 meters but did qualify at 200. He ran career-bests at both 60 and 200 meters indoors, showing he’s improved both the acceleration and top-end speed endurance needed to succeed outdoors at 100. He’ll take on the indoor DII 60-meters champ in Mobolade Ajomale of Academy of Art. Who ran 6.57 to take the DII crown. He also ran 20.82 over 200 meters to finish runner-up there, and was an IAAF World Indoor Championships semifinalist the following weekend over 60 meters. The field will also feature Jonathan Addison of NC State, who just missed the DI long jump title by two centimeters. He’s already run a career-best 10.58 and an even faster, wind-aided 10.47 (+3.1m/s) at last week’s Raleigh Relays, but he’ll have to move a bit faster if he wants to keep up with Arkansas’ Jarrion Lawson as a dual sprint/long jump threat. A pair of NCAA Champions from earlier this month clash in the women’s version of the 100, as well. Felicia Brown came from way under-the-radar to become one of the fastest 200-meter sprinters in collegiate indoor history this season, while Quanesha Burks of Alabama continued to assert herself as the woman to beat in the long jump. Brown has a slight edge over Burks in terms of wind-legal career-bests, with her 11.44 checking in just ahead of Burks’ 11.52. Both are making their outdoor debuts this weekend, and both of them could be chasing down Florida’s Shayla Sanders, however. Just this past weekend, Sanders ran a career-best, nation-leading 11.13 at Southern California to kick off her outdoor campaign. Just because Stanford is the hub of distance running this weekend doesn’t mean it’s the exclusive hub of distance running. Gainesville plays host to the weekend’s deepest field at 800 meters with the Penn State trio of Brannon Kidder, Isaiah Harris and Robby Creese taking on Florida’s Andres Arroyo and Alabama’s Jacopo Lahbi. Kidder’s phenomenal indoor regular season came to a disappointing conclusion at the NCAA Championships with a seventh-place finish in the 800 final, while his frosh teammate Harris failed to make the final altogether. They’ll be looking to bounce back this weekend in Gainesville, as will Arroyo, who entered as one of the favorites alongside Kidder and Harris, but was 15th overall. Lahbi showed potential at last year’s SEC Outdoor Championships with a 1:46.79 clocking that seeds him No. 7 among all returners, but has yet to recapture that lightning in a bottle since. Formerly an NCAA Champion at 800 meters both indoors and out, Brandon McBride of Mississippi State will test his endurance at 1500 meters this weekend against 2016 NCAA Indoor Champion Henry Wynne of Virginia. Those two will face off with the likes of Edwin Kibichiy of Louisville and Craig Engels of Mississippi.